Robin Hobb has been on my "should" read list (not "must" read) for some time now since reading her Farseer Trilogy (Assassin's Apprentice, Royal Assassin, and Assassin's Quest). These are good, enjoyable books. I thoroughly enjoyed Assassin's Apprentice, and the next two books were fine. However, with Ship of Magic, Hobb has vaulted to my "must" read list. Ship of Magic is the first of a series, The Liveship Traders. The basic premise of the series is that ships made of wizardwood, a very expensive wood available in the inhospitable lands of the Rain Wild River, can magically ripen into sentience--a liveship. This awakening takes three generations of captains from one of the trader families of Bingtown, a trading port on the Cursed Shores. Each ship is extremely expensive, and a trader family might have to work for generations to pay one off. This is an interesting idea, but without good writing, without good characters, that is all it would be--a good idea. But Hobb has woven a rich interlocking tapestry of people, ships, and situations which kept me glued to the book. While there is no single central character per se, there are several who take center court. There is Vivacia, a liveship of the Vestrit trader family newly awakened into sentience but into a tumultuous and unhealthy situation. There is Althea Vestrit, the willful young daughter of the ship's captain who thought she was going to inherit the ship only to have those hopes dashed upon his death. There is Brashen Trell, the young scion of a powerful trader family disowned by that family and now a capable ship's mate. Kyle Haven is Althea's brother-in-law. He becomes captain of the Vivacia, kicks Althea off, and drags his unwilling son, Wintrow, out of a monastery and onto the ship (the ship needs someone of Vestrit blood on board). Then there is Kennit, a pirate bent on both obtaining a liveship and becoming King of the Pirates. And finally, there is Paragon, a beached liveship, deemed unlucky and crazy by most. There are a host of other characters, alien life forms, and serpent-like creatures who hold an important, if yet unrevealed place in the center of the story. These characters are fleshed out very well. And with only one exception (Wintrow's very stupid and headstrong sister Malta), each of the characters is very believable. I really like the fact the "good guys" are not 100% good, and the "bad guys" are not 100% bad. Althea was not the sailor she thought herself to be when she was playing on Daddy's ship. It takes posing as a man and working as a sailor for her to find herself. Brashen, the white knight figure, is fond, if not addicted, to a drug. Kyle, although his ignorance will have some grave consequences, is really trying to do his best for the entire Vestrit family, at least in his mind and in his terms. This is real life. People are not all evil or all good, but too many writers today cubbyhole their characters just this way. Of course, the situation surrounding the characters is hardly stable. New traders, granted land by the emperor are beginning to have an effect in Bingtown. Slavery is growing in use, and the serpents are on the move. The long-standing traditions and practices are slowly being eroded away. The Chalcern States, long-time enemies of the Bingtown Traders, have been tasked by the emperor to move their ships to the Cursed Shores with fighting pirates as an excuse. Mix together a unique and clever idea, great characters, and an interesting plotline and you have a great book. Easily the best book I've read this year (and in my Lifetime Top 10), I was anxiously looking at the dwindling pages left as I was reading it, knowing that as soon as I was done, I wouldn't have the joy of discovering each new page. It made me wish for my childhood dream invention, a brain zapper which would remove all memories of a good book so you could enjoy it for the first time again and again and again. I felt the the second two books of the Farseer Trilogy did not match up to the first. 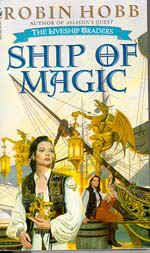 Ship of Magic is a superb book, though, totally engrossing, and much better than the enjoyable Assassin's Apprentice. I pray that Hobb will be able to keep it up for the next two books, and I am eagerly awaiting their release.